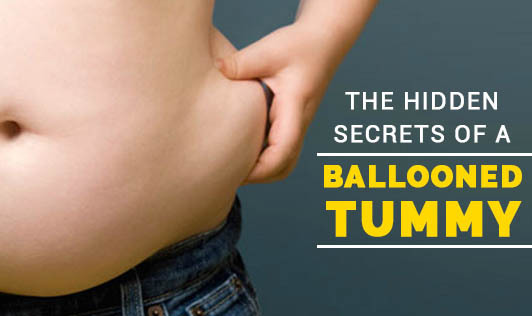 Have you always got a ballooned belly? Despite several of us complaining that we frequently suffer from an uncomfortable bloated stomach, very few of us actually seek help to ease the condition. Bloating is nothing but the buildup of gas in the intestinal tract. There are several known causes of bloating like, eating too much of fatty foods, poor digestion, and food allergies or sensitivities, and some unknown causes like eating too many fruits, menstrual cycle, chewing on your pen cap etc. Read this article to know why certain foods cause bloating and how you can reduce the symptoms of bloating. Eating Too Much of Refined Foods- Refined foods often leads to constipation, and leaves you feeling bloated and stuffed. To prevent bloating, one needs to improve their bowel health. Include at least 25 to 35g of fiber in your diet. Make sure you're taking a combination of soluble and insoluble fiber in your diet every day. You can include soluble fiber-rich foods like flaxseeds, fruits, carrots, oats, and barley, and insoluble fiber-rich foods like fruits, dark-green leafy vegetables, nuts, and whole grain cereals in your diet. Chewing Gum- Chewing gum may help you prevent bad breath, keep your teeth clean or may even help you control your food intake; however it comes with a disadvantage. Chewing gum can often cause bloating. This is because while chewing, you take in a lot of air and this increases the amount of gas in the digestive tract, leading to bloating. Gums also contain high levels of hard-to-digest artificial sweeteners like manitol and sorbitol which are known to contribute to abdominal gases and bloating. If you have the habit of chewing gum, you can replace them with healthy nuts or may be some fat-free popcorn. High Sodium Foods- The high salt, preserved, packaged food causes your cells to retain water and leads to bloating and abdominal distention. You can reduce bloating by substituting the salt in your diet with spices like garlic powder, oregano, or black pepper, or sour foods like tamarind, lemon, and vinegar. Diet Foods- The biggest hidden source of bloating is the hard-to-digest artificial sweeteners found in low-calorie diet foods. Make sure you check the nutrition label for sweeteners before you buy any diet food. Smoking or Chewing Pen Tops/Caps- These 2 common habits can often cause bloating, as both involve taking in excess air and saliva. Smoking is also known to affect digestion as the chemicals in cigarettes weaken the lower oesophageal sphincter and cause the stomach contents to flow back into the oseophagus causing gas. You need to stop smoking and pen-chomping to prevent bloating. Poor Water Intake- Dehydration is a common cause of bloating. Poor water intake makes the body fear shortage and the body starts to retain water, causing bloating. At the same time drinking too much of water at a time can also cause bloating as the body cannot absorb large amounts of water, all at once. Take small frequent sips of water throughout the day to prevent bloating. Eating Quickly- Not chewing food properly and eating quickly causes swallowing of air leading to belching and bloating. Eat slowly and chew your food properly before swallowing. Raw Vegetables- Although an excellent source of vitamins and minerals, raw vegetables can cause bloating when eaten in excess. Stir fry or steam your vegetables slightly to reduce that bloated feeling. Aerated Drinks & Alcohol- The carbonated component of alcohol and aerated drinks causes bloating. Avoid aerated drinks and alcohol to avoid bloating. Cruciferous Vegetables- Vegetables like Brussels sprouts, broccoli, beans, onions, and cabbage may be scrumptious and nutritious foods, but they also give away to major bloating. These vegetables are difficult to digest and cause gas and bloated stomach. Try avoiding these foods on days when you already feel bloated. Caffeine: The acidity in coffee can cause irritation and stomach upset, which appears like bloating. Try reducing your coffee intake to keep bloating away. Stress: Stress affects the body's ability to digest food. When you are stressed the body releases hormones adrenaline and cortisol, which prevents the digestive system from working effectively and causes bloating. Relax and meditate on the days you feel more stressed out. Lastly, always exercise to reduce bloating. Try going for a walk or attend a yoga class with a friend to help prevent bloating.